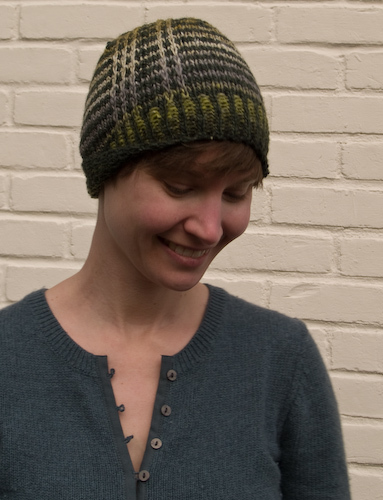 I hadn’t knit a hat in a good long while — I’d almost forgotten how satisfying they are. Vivian Aubrey’s snappy little Gridlock design caught my eye when she released it last month, and the timing was perfect because I needed a quick birthday present for my cousin Asa. 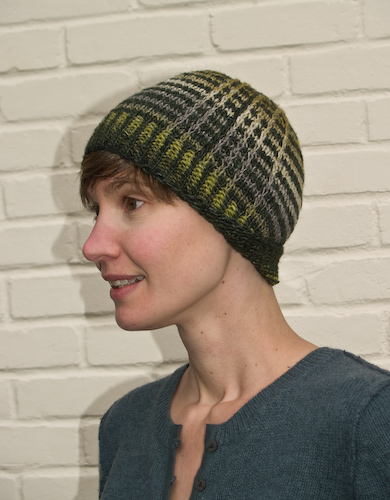 Unfortunately, it was knit and gifted so quickly that I didn’t even get a photograph, but luckily I turned around a made a second Gridlock. It’s Noro: Cash Iroha and Silk Garden (the colorway that also contains lavender and a splash of turquoise, but I didn’t get that far into the skein). I knit it a little bit too long. You’d think someone who’s been knitting for, what, eight years now? and has knit all kinds of lace and sweaters and designed her own stuff and whatnot could have mastered Hat Depth to Crown Shaping by now, but apparently you’d be wrong. I used to start the decreases too soon and the hats wouldn’t cover my ears, and now I seem to be over-compensating. So I’ve had to turn up the brim at the nape of the neck… here’s hoping my friend Caroline won’t mind wearing it that way, because it’s for her. 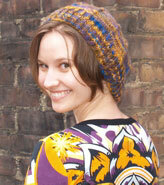 Maybe I should knit more hats. Or, you know, use one of my several perfectly functional measuring tapes and start the decreases when the pattern says I should. Well, I think it looks great with the brim turned up at the back! If he’s lost the rooster hat, time out may be in order. Terrific hats! Even though I live in a warm part of the country, I couldn’t agree more–plenty of hats are a must as long as there’s a chill in the air!